In glossy apothecary style amber bottles and containers and with wonderful fragrances, Pure Elements is a sustainable, clean, fresh approach to remedies and therapies for hair, in harmony with science and nature. 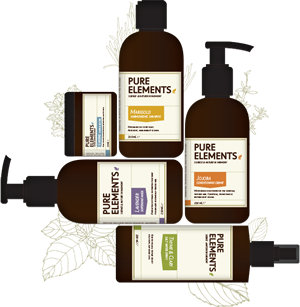 Although Pure Elements is not an organic range, it is paraben and sulphate free but uses silicons in some of it's references. Formulated by the original PACT chemist, the powerful combination of pure natural plant and flower extracts, 100% pure essential oils and scientifically-based ingredients ensure peak-performing quality pure products, suitable for all hair types. A professional, salon-focused range of environmentally responsible products, Pure Elements balances performance and nature in hair care and styling products to deliver superior results, every time.